KALANGALA-The Fisheries Protection Unit has shot and injured a fisherman suspected to be involved in immature fish trading. Robert Kayanzi was shot on Friday at Bosa landing site in Bufumira Sub County, Kalangala District as he tried to flee from Uganda People’s Defence Force-UPDF soldiers according to reports. 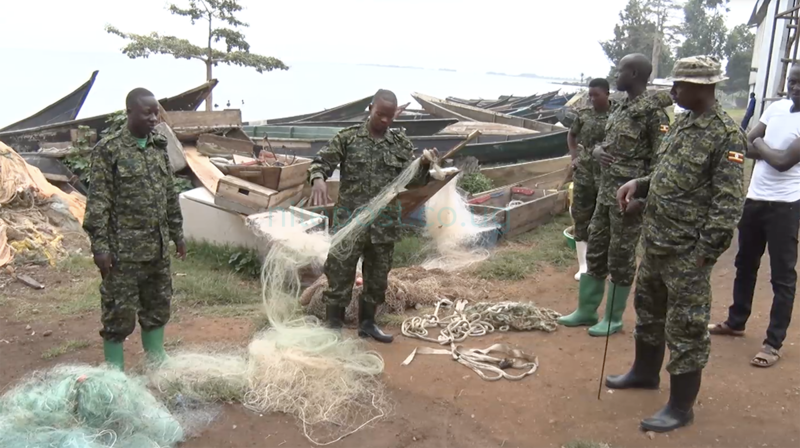 An eyewitness Deo Miiro says that when the soldiers arrived at Bosa landing site, they searched for Kayanzi until he was found in his house with immature fish. According to Miiro, Kayanzi tried to flee but was shot by one of the soldiers. Kayanzi is currently admitted at Entebbe regional referral hospital. Kalangala RDC Daniel Kikoola says that fishermen should avoid engaging in illegal fishing activities. He, however, asked the fisheries unit to arrest the culprits instead of shooting. In October, the fisheries protection unit shot dead a fisherman in Kalangala for allegedly involving in illegal fishing activities. Innocent Abaho, the in-charge Fisheries Protection Unit in Kalangala says that Miiro has several times been warned against engaging in illegal fishing, in vain. The Fisheries protection has in the past been accused of extortion and acting with force against fishermen.